✅HANDMADE, NATURAL, UNIQUE, ATTACTIVE, made from 100% real natural rattan fiber with handwoven knitting skills by local Bali (Indonesia) Artisans. 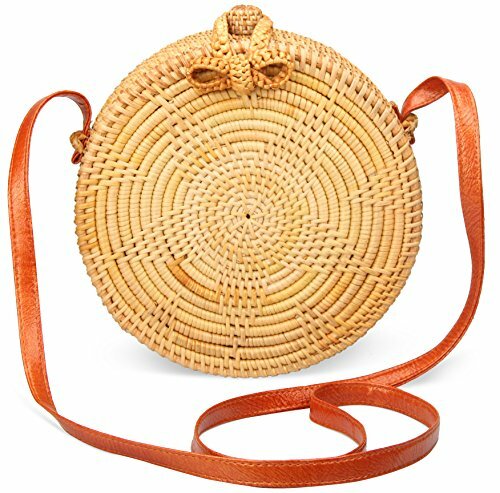 ✅BLOGGER, TOP 10 HIT HOLLYWOOD BAGS FOR WOMEN: As seen on social media / fashion blogger and fasion web, exactly same source product with great value, it is best choice for you, Handmade Woven Rattan Round Straw Crossbody Tote Bag With Shoulder strap Beach Bag for Women with Unique Star pattern. ✅A PERFECT GIFT FOR WOMEN: This is a unique gift handcrafted by Artisans,It is so cute and attractive, it will be memorable and unforgettable for every travelling, casual, honeymone, beach time, the model 5feet 9inch tall with this bag, it fit all. ✅100% SATISFACTION GUARANTEED: We guarantee you\'ll love this wonderful product. But if you\'re not satisfied with it, please get in touch with us. We will gladly give you a 100% refund. No questions asked! ✅SIZE,ROOMY: Approximate Diameter: 8\" (20 cm) Width: 3.5\" (8 cm). shoulder straps length: 50\" (125 cm) durable PU material, Fits phones, wallet, sun glass, make ups.